Sharkoon has made an offer you cannot refuse – this maker of computer peripherals now offers the Shark Zone GK15 combo, which includes a G15 gaming mouse and a gaming keyboard with the same name. Unfortunately for some users you will not be able to purchase the keyboard or the mouse separately. The Shark Zone GK15 gaming keyboard measures 483 x 192 x 34 mm and weighs 862 grams. The keyboard lacks any special features and you cannot even replace broken keys but it does have RGB LEDs that are colored in red, green or yellow colors. 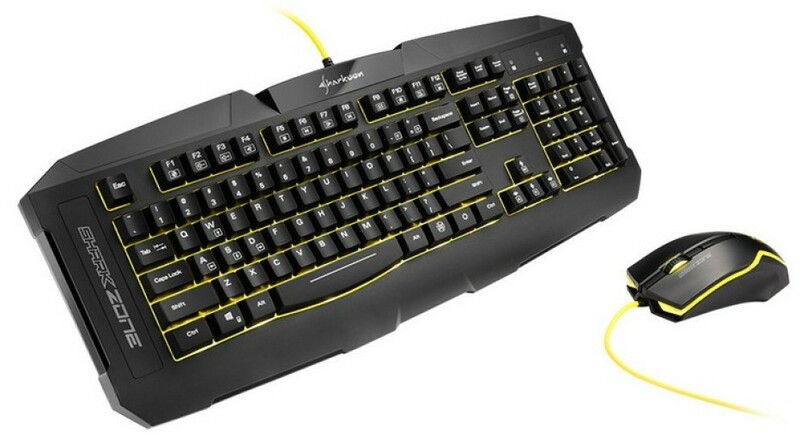 The cable of the Shark Zone GK15 keyboard is 180 cm long so you won’t have problems with it. As to the Shark Zone GK15 gaming mouse – it has been designed for all kinds of people so even left-handed users should be okay with it. The mouse features a simple design with no extra buttons but even then there are four of them. The Shark Zone GK15 mouse is based on a PixArt PWM3610DM-SUDU memory controller that sports 3200 dpi of sensitivity and has 10g of acceleration and speeds of up to 7.6 meters/second. The mouse also has RGB LEDs and measures 123 x 73 x 40 mm for total weight of 115 grams. The entire Shark Zone GK15 combo costs just EUR 30, which is a great price for all the hardware that you get.